Spring is a great time to get started with your lawn maintenance. Besides giving you the opportunity to enjoy your garden on a beautiful warm day, spring pruning allows you to shape and manage plants while they are still dormant. Dormancy helps you see plant form and structure clearly, making it easier to plan how you would like to direct future growth. Pruning creates wounds in the plant that will take time to heal. 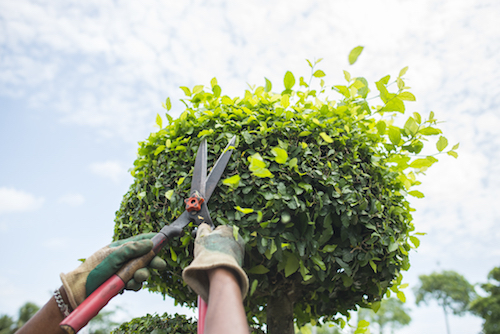 As spring marks the beginning of the growing season for most plants, early spring pruning allows the plant to heal quickly during this rapid-growth time. Additionally, because parts have been pruned away, your plants will enter this growth spurt with extra resources stored in their roots. Spring pruning can rejuvenate some types of plants but harm others. 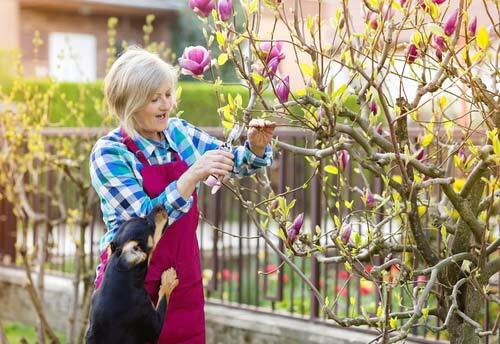 To determine which plants need to be pruned in the spring, you need to know when they blossom. Plants that blossom in summer should be pruned in early spring, and those that blossom in early spring should be pruned after they flower. In cold areas, ideally, you should wait to prune plants that bloom in summer until all danger of frost has passed. For perennials, like pine, juniper, or hollies, you should focus on fixing plant shape and removing unruly or unwanted branches. Nearly all fruit trees are best pruned in early spring, but some trees, like oaks, crab apples, and elms, have strict pruning windows so you can avoid giving pests access to fresh cuts. Check with experienced arborists in your area to be sure. Not all trees and shrubs are suited for spring pruning. Although it isn’t dangerous for the plant, the number of blossoms it can grow will be sacrificed if it’s pruned during spring. Plants like magnolias, azaleas, and hydrangeas, which flower in the spring, should be pruned in late summer or fall, immediately after they flower. Deciduous trees should be pruned just before they leaf out. For early spring bloomers like redbud and dogwood, pruning should be postponed until after the flowers fade. Trees like birch, walnut, and maple, bleed sap after pruning, which is not necessarily harmful. But pruning in fall or early winter, before the sap starts flowing, can reduce bleeding. Pruning for roses depends on the location and type of rose. Pruning is one of the best things you can do for the health of your garden, and using the right tools will save you a lot of time and effort. 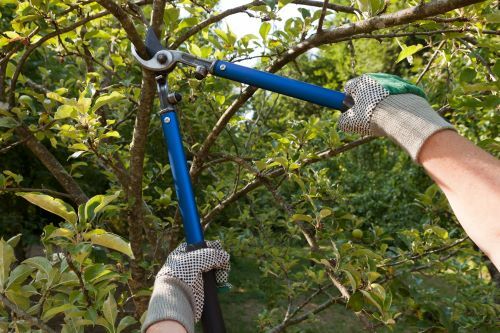 There are four basic tools to help you carry out most of your pruning tasks: hand pruners, loppers, shears, and saws. Pruners and loppers are sharp, shear-like devices used to cut stems and branches. Loppers are ideal for trees, climbing vines, and large shrubs. For heavy-duty cuts, they provide greater leverage with minimal effort. Buy good quality tools. They stay sharp longer and work better. Buy tools with carbon steel blades. They sharpen easily and hold their edge longer than less expensive blades. Buy tools with replaceable parts. Being able to replace blades, springs, and handle covers will keep your pruners functioning longer and in repairable condition. Tools that are assembled with nuts and bolts, rather than being riveted together, usually have replaceable parts. Consider the type of pruners you need. Anvil pruners have a single blade, sharp on both sides, that crushes and tears off the stem, making it ideal for blunt cuts of dead branches and dry, hard, and old growth. Bypass pruners have a single blade sharpened on only one side. This sweeps past the lower sharpened jaw for a precise cut that’s ideal for new growth. Make sure to maintain your tools by keeping them sharp. Sharp tools cut easier and more cleanly, and last longer. Also, always clean your tools before putting them away. Without that, a tool used to cut an infected plant can spread disease to your entire garden. The right amount of pruning simulates vital growth for plants. When a plant loses a number of stems from the top, it tries to restore equilibrium by accelerating new growth on top to balance the resources stored in its roots. In moderation, this regrowth is great, as it allows plants to heal and get out of dormancy. But too much pruning can send the plant into panic mode, where it may try to push regrowth from latent buds on the trunk or a branch, resulting in water sprouts. Too little pruning might shape the plant a little but fail to simulate any new growth in the plant. As a rule of thumb, pruning about 1/3 of the growth of an established, healthy plant is a good practice. This 1/3 rule can be applied to most shrubs and small trees, but for larger shade trees, pruning should be limited to about 1/4 of its total branches. Pruning involves making multiple cuts in the stem of a plant. These can leave the plant susceptible to disease and infections. 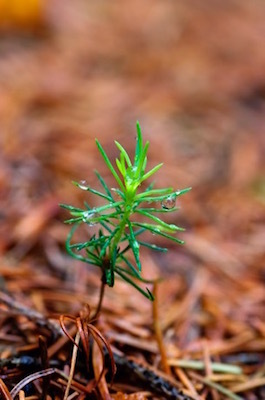 So while pruning your garden, try to make clean cuts to facilitate a swift and healthy healing process for your plants. A clean cut slices the wood without tearing it. Dull blades tear wood fibers, killing more living cells and blocking the healing process. To make a clean cut, you need to start with sharp tools. When cutting old branches off hardwood trees and shrubs, pay attention to the slightly swollen “collar” around the base of the branch. Try to cut just above this ring for a clean cut. Never cut into it. For smaller plants, locate your cut just above a strong node with either one or more healthy buds or a healthy offshoot. Ideally, prune to a bud or offshoot that is healthy and pointing in the direction you want future growth to occur, usually away from the center of the plant. It is usually worth pruning extra to accomplish this since it favors the development of a good structure. If you have questions about which trees to prune when, or if you’re not feeling confident about doing your own spring pruning, contacting a professional like Vernon Imel Tree Service is a great option. Skilled arborists will use their expertise to do the job right and keep your trees healthy and growing strong year-round.